It's not just the sunloungers the Germans get to first. Sometimes – very occasionally – they're first with music too. The problem is that myopic Brits often tend not to notice, and so the achievements of our brethren from mainland Europe are belittled or ignored. That's the case with Dissidenten, a group from Berlin who were experimenting with mixing African and European music decades before Damon Albarn had thought of checking airfares to Mali. It's often said that the internet has taken the mystery out of music, that anyone can find out anything about any group now. That's not true with Dissidenten. They were a mystery in 1984, when John Peel started playing a record they'd made called Sahara Elektrik. All he knew was that Dissidenten were from Berlin, and that they'd gone to Morocco to record an album with local musicans. To which I can add that the local musicians were called Lemchaheb, and that this was part of a pattern of Dissidenten visiting different countries to sup on their music. And, really, there's not a lot more I can be certain of – you can check out their German Wikipedia entry if you like, though the English translation raises as many questions as it answers. You don't need to know anything about Dissidenten or Lemchaheb to hear the wonder of Sahara Elektrik. It seems to begin with a musical pause for breath, as if the musicians realise they've got a long journey ahead of them. A stringed instrument – an oud, I think, but I'm not putting my house on it – jumps in and sprints ahead, like a lone rider setting off before the full caravan – the bass, the percussion, the voices – follows on behind. It's music that fires the imagination: I can't speak to its authenticity, but it's vivid and dramatic, swooping and soaring, sometimes sunny and sometimes stormy, digressing from its route to visit solos, but returning always to that unrelenting topline melody. Sahara Elektrik feels to me like an exploration of an imagined North Africa, one where implausible excitement and unspoiled beauty exist side by side. If I were to make a comparison, it would not be to another record, but to the Indiana Jones films – it's not real, it's a good job it's not real, but imagine if the world really were like this! Visit Dissidenten's world: it's addictive. 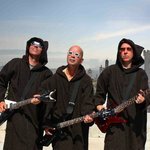 You might also want to check out Embryo, the pre-Dissidenten band of Müllrich and Wehmeyer. Not sure about the "Godfathers of World Beat" epithet applied by Rolling Stone, though. In terms of World Music precursors, (if you disregard the odd sixties sitar here or there) I'm more inclined to look at the seventies jazz fusion groups, particularly Weather Report, or Miles' mid seventies twin guitar bands with their Stockhausen/African trance groove approach. Trilok Gurtu, an important inspiration for the Dissidenten musicians, was also working from "the other side" in fusing musical cultures from the seventies onwards. Dissi's "Telephone arab", one of my all time favourite song and video, might be on youtube. 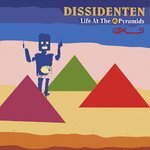 I actually relistened to their album "Life at the Pyramids" in the wake of the "Arab spring" after yonkers and truely enjoyed it. Aaah, the 80's, Raj (levanthian pop music) was huge then and so was Ms. Ofrah Haza. It's of course a coincidence but the silhouette of the praying Arab in front of what looks like the Twin Towers is spooky. It's a good album, but while they did it well, I'm certainly not convinced by the claim they got there first (unless it's to justify the hoary sunlounger joke). There was Eno/Byrne's My Life In The Bush of Ghosts, which used samples from the Music in the World of Islam series; Cabaret Voltaire's Red Mecca and Yashar; and aside from that there's a whole strand of early 80s pop that made use of middle eastern infuences, from Siouxsie and the Banshees and David Bowie to Madness. That's not to mention Brian Jones earlier recordings of the Joujouka Master Musicians and the rai music that could be heard all over Paris, and which started to filter over to the UK. An Italian friend put this on a compilation tape back in the 1980s - sunshine to my ears. And some thunder too - they were brilliant at Womad this year, so good we couldn't tear ourselves away to see the main headliners on the final night!. Still political, still concerned, with solid Germanity and a shiny metal hurdy gurdy! I bought this wonderful release on cassette at a bargain bin at Womad a good 15 years or so ago - I think I paid a pound. Time is ripe for a CD re-release I would think. 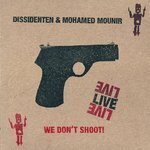 I have a couple of Dissidenten's other world fusion releases but they do not compare with this one. German rock has always had its innovators - Amon Duul II, Kraftwerk and, of course, the mighty Can - but as for being first at the poolside with this sort of East-West fusion what about Davy Graham in the early 1960s, or the Incredible String Band's (fellow Moroccan travellers) with their habitual use of exotic instruments like sitar and gimri?